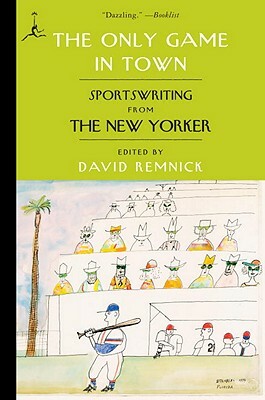 For more than eighty years, The New Yorker has been home to some of the toughest, wisest, funniest, and most moving sportswriting around. The Only Game in Town is a classic collection from a magazine with a deep bench, including such authors as Roger Angell, John Updike, Don DeLillo, and John McPhee. Hall of Famer Ring Lardner is here, bemoaning the lowering of standards for baseball achievement—in 1930. John Cheever pens a story about a boy’s troubled relationship with his father and the national pastime. From Lance Armstrong to bullfighter Sidney Franklin, from the Chinese Olympics to the U.S. Open, the greatest plays and players, past and present, are all covered in The Only Game in Town. At The New Yorker, it’s not whether you win or lose—it’s how you write about the game. David Remnick has been the editor of The New Yorker since 1998. A staff writer for the magazine from 1992 to 1998, he was previously The Washington Post's correspondent in the Soviet Union. The author of several books, he was awarded the Pulitzer Prize and the George Polk Award for his 1994 book Lenin's Tomb. He lives in New York with his wife and children.